Mandalay Bay is the southernmost major resort on the Strip. This location offers the key advantage of being much closer to McCarran International Airport. This is an advantage with faster and less expensive transportation to and from the airport. Check-in time is 3:00 PM and check-out time is 11:00 AM. Pre-registration is available usually beginning around 12:00 PM for early arrivals; to guarantee an early check-in, contact the Front Desk. This world-famous aquarium and conservation center is a must-see for Las Vegas visitors of all ages! It’s home to over 2,000 aquatic creatures, including its namesake sharks, stingrays, turtles, piranhas, and a Komodo Dragon. Daily feeding experiences and even Shark Diving are available! Dive deep into a fun, educational, and unforgettable adventure! Shark Reef is open from 10:00 AM to 8:00 PM Sunday to Thursday and 10:00 AM to 10:00 PM Friday and Saturday. Michael Jackson fans of all ages and even casual observers will thoroughly enjoy this rousing tribute to the King of Pop. One of several Cirque du Soleil shows in Las Vegas, it’s impossible to go wrong with music and aerial excitement. Rolling Stone Magazine calls this high-energy production "a virtual parade of wow." Your kids will agree wholeheartedly. Show times are Friday-Tuesday at 7:00 PM and 9:30 PM. Tickets can be purchased online or at the box office. The Mandalay Bay Beach is much more than a swimming pool! It encompasses four pools surrounded by palm trees, fountains, and waterfalls, including a massive wave pool and a sandy beach with 2,700 tons of real sand. The Lazy River is perfect for all ages on a scorching summer day. Rafts and inner tubes are available for rental, as are daybeds, cabanas, gazebos, bungalows, and villas. Plenty of free chairs and chaise lounges are open to all on a first-come, first-serve basis. Mandalay Bay Beach is open daily from 8:00 AM to 5:00 PM. There is simply nothing else like Blue Man Group. Their creativity, exuberance, humor, zest for life, and energy simply must be seen to be believed. The show is jam-packed with music and humor that’s a blast for all ages. Leave your expectations at the door, bring the kids, and see what it means to live life In Full Color. Shows are nightly at 7:00 PM and 9:30 PM. 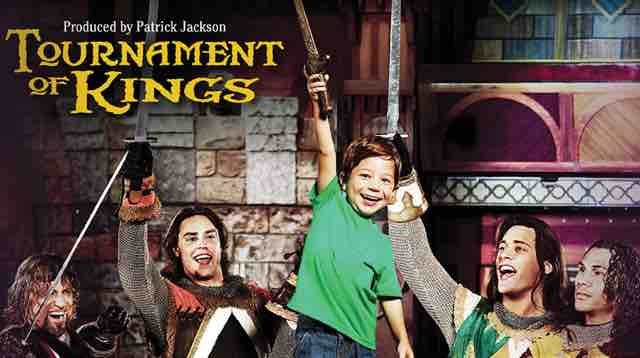 Go back in time to the Middle Ages with this sumptuous dinner show that’s part history, part feast, and all fun. Knights joust and compete amid a special effects and pyrotechnics bonanza. Guests sit in a 360-degree arena and enjoy a three-course meal while taking in a truly epic story of deceit, honor, and chivalry. Kids will love the action and eating medieval-style: with their hands! Showtimes are 6:00 PM Monday and Friday, 6:00 PM and 8:30 PM Wednesday, Thursday, Saturday, and Sunday. The NHL has found a great home in Las Vegas, where the city’s unique flair and history comes together for a sports experience like no other. Golden Knights games are great for a special family night out and there’s no need to worry about dinner beforehand! There’s plenty of dining options on the T-Mobile concourse along with shops and activities for all ages. Don’t forget to pick up a plush Chance the Gila Monster while you’re there. Don't be misled by the name: Noodle Shop., serves a lot more than noodles. It’s a traditional Chinese restaurant with plenty of menu options to suit all takes and all ages! Noodle Shop is open from 11:00 AM to 10:30 PM Sunday to Thursday and 11:00 AM. to 12:30 AM Friday and Saturday. The whole family’s burger cravings can be satisfied at this joint! It’s hard to go wrong with the American Classic (Angus beef with American cheese, bacon, tomato, and onion) on a sesame bun. The more particular eaters can customize their burgers with a choice of proteins, bun, toppings, and of course delicious sides like fries and onion rings. In the mood for something sweet? Dip into a tasty milkshake! Choose from timeless flavors like vanilla, chocolate, or strawberry, or specialties flavors like Nutella or the Pink Monkey. Burger Bar is open from 11:00 AM to 11:00 PM Sunday to Thursday and 11:00 AM to 12:00 AM Friday and Saturday. Tasty New York-style pizza with a thin crust, as well as salads, sandwiches, wings, and more. The menu caters to all tastes and dietary needs and even includes a vegan section perfect for plant-based appetites. Split an 18-inch pie with the whole family, or build your own personal 12-inch. Slice of Vegas is open from 11:00 AM to 11:00 PM Sunday to Thursday and 11:00 AM to 12:00 AM Friday and Saturday. Can't decide on one spot for a casual family lunch? No need to worry! The Mandalay Food Court has a little something for everyone with budget-friendly choices like Nathan’s Hotdogs, Johnny Rocket, Pan Asian Express, Bonanno’s Pizzeria, and Subway. There's a plethora of options to suit all tastes here, all at very reasonable prices. The Mandalay Bay Food Court is open 24 hours. Individual restaurant hours may vary. Other great dining options at Mandalay Bay include Citizens Kitchen, House of Blues, BBQ Mexicana, Sea Breeze Café, Yogurt In, and more. Mandalay Bay does not offer on-sight childcare. Mandalay Bay participates in MGM’s M Life Rewards program. Members earn points and perks with every dollar spent at participating properties. Mandalay Bay charges a daily resort fee of $41.95 that includes internet, fitness center access, and phone calls. Summing up: Is Mandalay Bay Child-Friendly? With its unique attractions and wide array of dining options, Mandalay Bay is a wonderful resort experience for all ages. Such a southern location may be a turnoff for families who want to be more central to Strip, but those who aren’t put off by a little bit of walking will love it.